Hey guys! 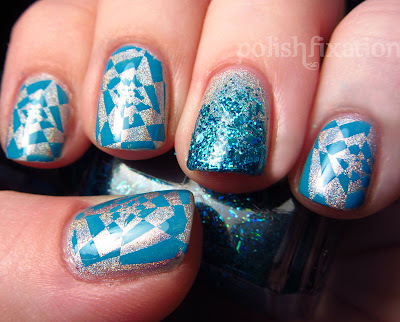 Really quick post today of the mani I wore over this past weekend! For this mani I painted my nails with Luderana Esplendido from the Aurora Boreal collection, and then I stamped an image from RA-114 with Sally Hansen Brisk Blue InstaDri polish. The accent nail is a LeChat glitter called Dancing Shoes. This mani was really fun and I got several compliments on it! I love the Red Angel stamping plates so much, there are many more designs I can't wait to try out! What do you think of this mani? Do you think stamping over holo looks nice? I love stamping over a holo, it looks fun & fresh to me. It's gorgeous and I love the accent nail! I love how you did these! Such a great look! I haven't seen this done much very creative of you. 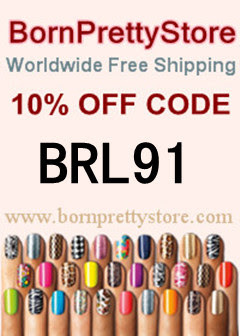 This is really fun and you always have to love a glitter accent nail! Damn girl!!! Looks like a funky puzzle!!! I love it!!!! Awesome combo! The holo as the base was perfect! It makes the design look really trippy! Haha. This looks so good Erika! 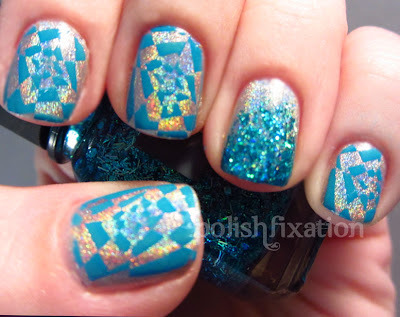 So cool-I love holos and peeking out-very cool!